We obtained other important degrees in recognition of our successes in kennel club competitions. Many times we have won the annual italian Kennel Club degree; this is based on results in dog shows and field trials. From 1985 we win the dog show award; in the last four years we have won the third place in working class. 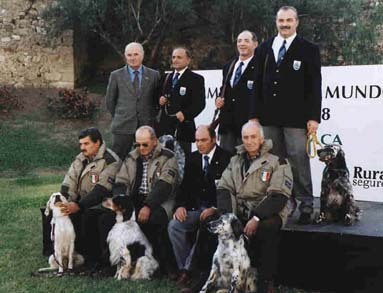 Our setters were members of italian team in hunting world championships: MAK in1996 (Cxech republic) and TEO in 1998 (Portugal).